Edited by a leading expert and with contributions from pioneers the three-volume Handbook of Nanostructured Thin Films and Coatings is a resource as dynamic and flexible as the field itself. 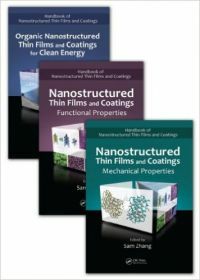 The first two volumes cover the latest research and application of the mechanical and functional properties of thin films and coatings while the third volume explores the cutting-edge organic nanostructured devices used to produce clean energy. The first volume Nanostructured Thin Films and Coatings: Mechanical Properties covers the mechanical properties (i.e. hardness toughness and adhesion) including processing properties and performance. It also offers a detailed analysis of theories and size effect in addition to other key topics. Volume Two Nanostructured Thin Films and Coatings: Functional Properties focuses on functional properties (i.e. optical electronic and electrical) and related devices and applications. The third volume Organic Nanostructured Thin Film Devices and Coatings for Clean Energy addresses various aspects of the processing and properties of organic thin films devices and coatings for clean energy applications. A complete resource this handbook provides detailed explanations for newcomers and the latest research and data for experts. Covering a wide range of mechanical and functional technologies including those used in clean energy these books feature figures tables and images that aid researchers and help professionals acquire and maintain a solid grasp of this burgeoning field.